According to recent news reports, Urthecast is planning to launch a satellite constellation of optical and SAR satellites by the end of the decade. Urthecast started its space business by installing Earth observation cameras on the ISS. If this constellation comes through, it will be the first commercial private SAR + optical constellation. Exciting times ahead for remote sensing, especially for radar imaging. One wonders how the general public will feel about the SAR imagery, because right now they can pretty much understand what optical imagery is showing them, as long as they stick to true color imagery. How they will feel about the “colorless” gray-scale intensity SAR imagery remains to be seen. Of course, with the possibilities of nearly concurrent optical and SAR imagery, the applications are endless, starting with the through-cloud and day-night capability of SAR imagery to support optical imagery. The proposed constellation is expected to comprise 16 satellites (8 optical and 8 SAR) flying in two orbital planes, with each plane consisting of four satellite pairs, equally-spaced around the orbit plane. Each pair of satellites will consist of a dual-mode, high-resolution optical satellite (both imagery and video) and a dual-frequency (X-band and L-band) SAR satellite (X-band and L-band) flying in tandem. See Urthecast official announcement about the constellation here, and a good news article about the plan here. P. S. Here is a non-related but interesting article about the kind of business prospects Urthecast is stepping into. This entry was posted in Uncategorized and tagged Earth Observation, Optical High Resolution Satellite Images, SAR on August 30, 2015 by WQ. Aerosols are suspended particles in the atmosphere and vary with size and volume. Aerosols emitted from anthropogenic and natural activities are associated with public health, hydrological cycle, Earth’s climate, and atmospheric visibility. For understanding of aerosols, accurate and reliable spatio-temporal measurements of aerosol optical properties such as aerosol optical depth (AOD) are required from local to global scales. The AErosol Robotic NETwork (AERONET) has been providing regular measurements of cloud–screened and quality–assured AOD at higher temporal (every 15 min) and spectral (0.340–1.060 µm) resolutions, but at a limited spatial resolution. This spatial limitation is overcome by satellite remote sensing which provides near–real time global AOD observations. This post is related to evaluation of the MODerate resolution Imaging Spectroradiometer (MODIS) aerosol retrieval algorithms including the Dark–Target (DT) algorithm [Levy et al., 2013], the Deep–Blue (DB) algorithm [Hsu et al., 2013], and the Simplified Aerosol Retrieval Algorithm (SARA) at 500 m resolution [Bilal et al., 2013] during extreme dust storm and haze events. For reliable aerosol retrievals, accurate method for the estimation of surface reflectance is perhaps the most crucial component. The DT algorithm estimates the surface reflectance based on the ratio of visible and shortwave infrared channels as a function of a vegetation index and scattering angle. The DT algorithm retrieves AOD only over dark-target surfaces having reflectance between 0.01 and 0.25 in the mid–infrared channel (2.21 µm), and is unable to retrieve AOD over bright surfaces including snow/ice, desert and urban surfaces with reflectance > 0.25 in 2.21 µm channel. The DT AOD observations are available for land and ocean surfaces at 3 km and 10 resolutions [Levy et al., 2013]. The DB algorithm utilizes deep blue (0.412 µm) wavelength, where surface reflectance is lower than for longer wavelength, for AOD retrieval. The surface reflectances are estimated for 0.412, 0.47 and 0.65 µm wavelengths using minimum reflectance technique. The DB algorithm retrieves AOD over all bright surfaces including desert and urban surfaces, except snow/ice, as well as for dark surfaces. The DB AOD observations are available only for land surfaces at 10 km resolution [Hsu et al., 2013]. The SARA algorithm utilizes the surface reflectance from the MODIS operational surface reflectance product (MOD09) available at 500 m resolution. The SARA algorithm retrieves AOD at 500 m resolution directly for singe channel without constructing a comprehensive look–up–table (LUT) based on radiative transfer model. As the SARA algorithm does not have prior knowledge of aerosol types over the region, this algorithm iterates a wide range of aerosol types and conditions to retrieve AOD [Bilal et al., 2013]. Recent studies reported that the DT and DB algorithm are unable to retrieve AOD in the presence of extreme dust storm (coarse aerosol particles) (Figure 1) [Bilal et al., 2014] and haze (fine aerosol particles) (Figure 2) [Bilal and Nichol, 2015] over Beijing–Tianjin–Hebei region due to their limitations for pixel selection criteria and aerosol model schemes used in the LUT. On the other hand, the SARA algorithm has ability to retrieve AOD and represent the true picture of atmospheric pollutants during extreme dust storm and haze pollution events over the region. Figure 2: Haze event over the Beijing-Tianjin-Hebei region on 5th October 2013: a) Band 4 pseudo color image, b) SARA AOD (500 m), c) MYD04 DT C6 (10 km), and d) MYD04 DB C6 AOD (10 km) (adopted from Bilal and Nichol, 2015). Bilal, M., J. E. Nichol, M. P. Bleiweiss, and D. Dubois (2013), A Simplified high resolution MODIS Aerosol Retrieval Algorithm (SARA) for use over mixed surfaces, Remote Sens. Environ., 136, 135–145, doi:10.1016/j.rse.2013.04.014. 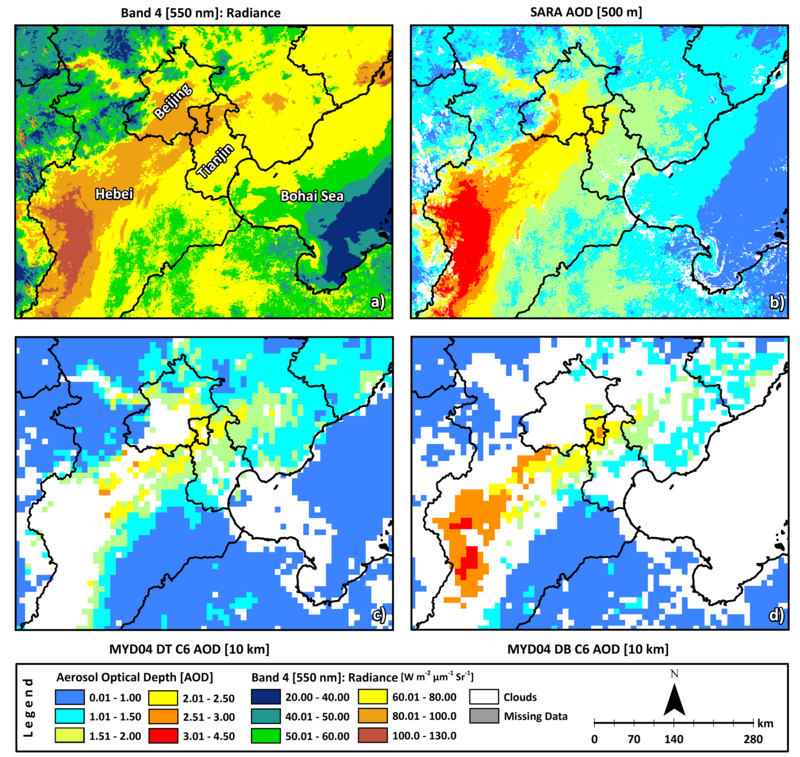 Bilal, M., J. E. Nichol, and P. W. Chan (2014), Validation and accuracy assessment of a Simplified Aerosol Retrieval Algorithm (SARA) over Beijing under low and high aerosol loadings and dust storms, Remote Sens. Environ., 153, 50–60, doi:10.1016/j.rse.2014.07.015. 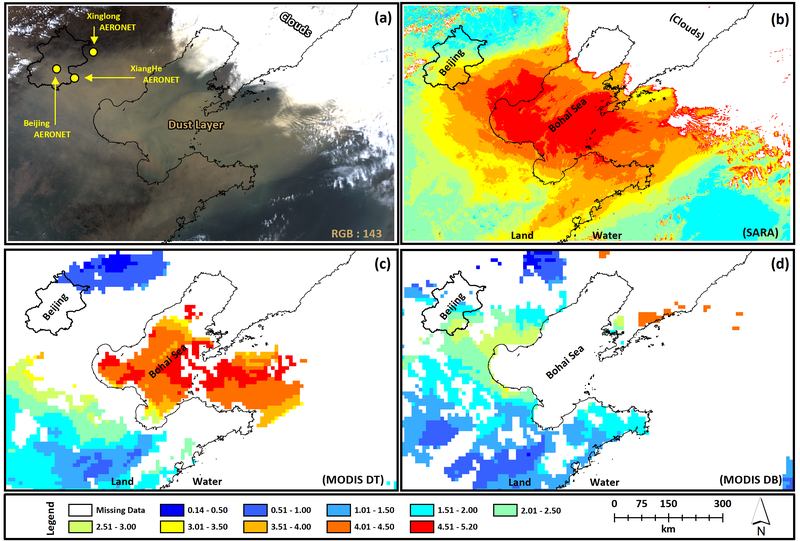 Bilal, M., and J. E. Nichol (2015), Evaluation of MODIS aerosol retrieval algorithms over the Beijing-Tianjin-Hebei region during low to very high pollution events, J. Geophysical. Res. Atmos., 120, doi: 10.1002/2015JD023082. Hsu, N. C., M.-J. Jeong, C. Bettenhausen, A. M. Sayer, R. Hansell, C. S. Seftor, J. Huang, and S.-C. Tsay (2013), Enhanced deep blue aerosol retrieval algorithm: The second generation, J. Geophys. Res. Atmos., 118, 9296–9315, doi:10.1002/jgrd.50712. Levy, R. C., S. Mattoo, L. A. Munchak, L. A. Remer, A. M. Sayer, F. Patadia, and N. C. Hsu (2013), The Collection 6 MODIS aerosol products over land and ocean, Atmos. Meas. Tech., 6(11), 2989–3034, , doi:10.5194/amt-6-2989-2013. About this post: This is a guest post by Dr. Muhammad Bilal Sheikh. Learn more about this blog’s authors here. This entry was posted in Uncategorized and tagged Aerosols, AOD, MODIS, remote sensing on August 18, 2015 by Muhammad Bilal. In this second part of the Sentinel-1 tutorial we will go through some simple steps to pre-process, georeference and export the data we downloaded using the procedures described in the previous post. To this end, we will use SNAP (Sentinels Application Platform), a free software package that you can download here. We begin by downloading and installing the SNAP software package from the above mentioned webpage. You will have to enter your name and e-mail address, and will then receive a message in your mailbox with a link to download the executable. Choose the one that is right for your specific platform. Installation is straightforward, at least in Linux, the platform I use. Important: at the beginning of the installation check the boxes that tell the program to also install the toolbox for Sentinel-1. This entry was posted in Uncategorized on August 9, 2015 by WQ. Creating a video is a cool way to visualise a time series of remote sensing data / outputs. Rather than creating a full video you can also use a GIF. One advantage of GIFs is you can embed them in Powerpoint presentations and they should will play in presentation mode (I’ve found them more reliable than videos in other formats). This entry was posted in Uncategorized on August 3, 2015 by WQ.